This is a typical easy lunch I’d have. It has carbs, protein and veggies. I like to eat small portions more often, I normally eat something every 3 hours. The flatbread/pancake (I am not really sure what to call it) is made of corn flour mixed with an egg and it’s cooked in a pan. 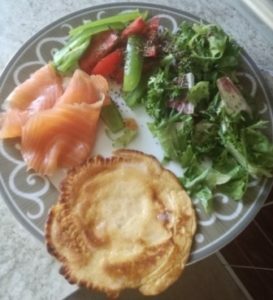 The protein is smoked salmon and there are a few tomatoes, bell peppers and lettuce all sprinkled with some oregano.